Independent venues are the lifeblood of live music. Before bands hit the big time and acts amaze audiences the world over, musicians need a space where they can cut their teeth. Somewhere they can play to real people and learn how to connect with their listeners, develop their own unique sound and learn how to become a legend. And it’s the smaller stages that allow this to happen. Promoters taking a chance on fresh talent, venue owners bravely holding their own against rising costs and an army of workers behind the scenes pulling pints, taking your cash at the door, carrying amps and sorting the sound levels. In a similar fashion to the well-publicised Record Store Day, Independent Venue Week is a timely reminder that without all this effort at a grassroots level nothing would grow and develop into the fantastic festivals, astounding arena concerts or the next big thing that we all enjoy. It gives all those cool clubs and quirky pubs a chance to proudly show off the acts so closely attached to them, and usually in an intimate setting that truly connects spectator with the spectacle on stage. 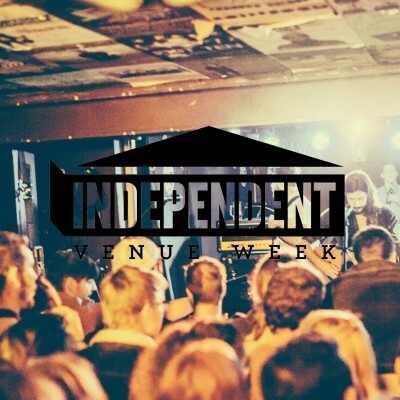 In respect for all the many hardworking people that come together to make so many wonderful gigs take place, Gigantic offers a brief list of just some of the many amazing events taking place during Independent Venue Week and beyond. So, join in with the celebrations and enjoy the many upcoming shows that can only take place with your regular attendance and support. Cool Leicester club The Cookie is the city’s premier venue for local talent and major names in music, located on the bustling High Street. In addition to the great music, The Cookie is also a host stage for the annual Leicester Comedy Festival, a major draw which attracts fans of stand up from all over the world. This year, The Cookie plays host to Steve Lamacq who will be presenting his BBC 6 Music programme in support of Independent Venue Week with a performance from Supergrass songwriter Gaz Coombes. Be sure to tune in all week to enjoy interviews and live performances from the many awesome acts taking part. Gigantic offers you the chance to take part in the action by offering you the Independent Venue Week 2018 Pass – on sale right now! First founded in the autumn of 2006, The Boileroom is an independent collective which offers excellent live music and creative art events plus club nights. Over the successive twelve years it has grown to become one of Guildford’s most popular venues, playing host to craft clubs, beer festivals and sought out by those acts on the cusp of major mainstream success. Coyly named in reference to Oxford Universities impenetrable elitist dining club, The Bullingdon is a very welcoming cocktail bar which has been trading for over 135 years and played home to live music for the last 20. After a recent referb, they have grown their crowd capacity and improved the lighting and sound system in anticipation for big things to come. Le Public Space (AKA Le Pub) is vibrant bar, arts space and venue which has been serving the people of Newport for over twenty years. In that time, Le Pub has developed a reputation for providing excellent food and drink whilst being the creative hub where you can enjoy great cinema in addition to their constant high quality gig headliners. Nottingham’s best kept secret, the entrance to The Chameleon Arts Café is hidden down a crooked alleyway and gives a wonderful view of the city’s Old Market Square once discovered. The small space is packed with character and has hosted early shows from the likes of Sleaford Mods, Royal Blood, Kagoule and Late Of The Pier.